Reaping the benefits of computer audio via an asynchronous FireWire DAC. We live in interesting and exciting times for music reproduction, largely due to the rapidly spreading use of music servers and computers to replay the music files instead of spinning the physical silver disc in a tray. Keeping up pace with the advent of hardware, distribution of musical content has changed drastically over the last few years with more and more internet websites offering music downloads, thankfully even CD-quality and beyond, although the availability of CD-quality and true high-resolution downloads could certainly be improved. As expected when great change is afoot, there is also great confusion and misinformation out there regarding computer audio and how it is best done. Various manufacturers, vendors, and "experts" get into heated debates over how best to accomplish this task on various forums on the internet almost daily, and the regular consumer is often caught in analysis paralysis and often makes costly mistakes. One needs to only search for something like "USB DAC" to see how passionately people feel about such topics. 1. About Filter A and B. These are stated to be "upsampling filters," but no real detail is given in the manual. Are they similar to other manufacturers upsampling filters, i.e. one is for say 96kHz and the other for 192kHz Upsampling? Does this mean DAC202 cannot be set to bypass upsampling (44.1kHz native playback with oversampling only?). Answer: The A and B filters are the ones used in the ES9018 DAC chip, i.e. the "factory presets" so to speak. In the ES9018 all input signals (independent of their sampling rate) are upsampled to about 1.5MHz. The B filter has a softer transition band than the A filter. We plan to add more filters to those two. (To further clarify,ES9018 based DACs use a 98.304MHz clock and outputs runs at 1.536MHz). 2. The analogue stage is reportedly reworked from DAC2/Minerva to DAC202. Is it a completely different design, and is it op-amp based output stage vs. discrete output stage? Answer: Yes, the analog stage is completely different from the one in the DAC2/Minerva. Both use op-amp based designs though. The DAC2/Minerva uses a specific line driver chip. 3. Is the jitter rejection system essentially a variation on the classic double PLL or something very different? - A digital PLL for a wide locking range and with noiseshaped jitter spectrum. - A subsequent analog PLL to reduce the jitter of the digital PLL. The noiseshaping helps a lot to achieve that. These two PLLs are contained in the Dice chip we are using for all digital interfacing. - The ES9018 DAC chip uses an asynchronous sampling rate conversion process which further reduces jitter. Perhaps the most salient feature of DAC202 is the very robust Weiss FireWire interface. The world is being bombarded by a flood of USB DAC's and USB-to-S/PDIF converters, and a new-and-improved version seems to be introduced almost daily, even from the same manufacturer. The upside is the sheer number of choices an audiophile has when choosing an USB DAC; the downside is the difficulty separating the good from the also-ran's, which can be a daunting task given the number of devices available. The general consensus, for what it is worth, seems to be in favor of asynchronous USB devices, and there are some fabulous USB DAC's available from reputable sources. Exhaustive discussion of asynchronous vs. adaptive USB is beyond the scope of this article, but in so far as FireWire vs. USB for audio interface, some background information may be necessary. Adaptive mode USB is the easy way to make an USB DAC, and unfortunately, this is the path most companies have taken. Usually the TI PCM270x chip is used and sometimes CMedia or PCM290x chips. While this method requires no new programming or lengthy development, it often suffers from high jitter and poor sound quality. A solid CD transport or a good pro soundcard will often provide superior S/PDIF digital signal compared to adaptive mode USB. Asynchronous USB takes the high road but requires arduous proprietary programming for the TAS1020 chip. R & D costs are high and currently only several high-end companies offer asynchronous USB DAC's. The upside is the improved sound quality compared to adaptive and even traditional S/PDIF; however, there are countless variables and degrees of execution involved, which is why asynchronous USB alone does not guarantee that perfect computer audio. Weiss has chosen the road less traveled, FireWire, which is more often used in pro studio equipment. This is not surprising since Weiss is a premier pro audio company, but it is still gratifying that they have carried on this technology into the audiophile branch of the company. Weiss FireWire interface is asynchronous but requires installation of a proprietary FireWire driver, which is no big deal if one knows how to insert a CD into the computer. Unless DAC's appear with both asynchronous USB and FireWire on the same chassis, it would be difficult to compare asynchronous USB to FireWire as far as audio superiority, but the Weiss FireWire interface certainly sounded better than the best S/PDIF signal available during the review period, which was a modified Lynx 2B pro soundcard with single-crystal silver S/PDIF cable and clock sync cable from the DAC. So how did DAC202 sound? Surprisingly, given that Weiss is a pro audio company, it did not sound at all dry, stark, bright, or analytical. Since there is a fair amount of hype surrounding the advanced technologies utilized in this DAC, the expectations tended towards something awe-inspiring, unforgettable, attention-grabbing, or severely different. This DAC in fact turned out to be probably the most self-effacing and chameleon-like DAC in this reviewer's experience, never demanding undue attention or sounding a sour note that sticks out. This can be a double-edged sword, since some listeners will mistake the smoothness, refinement, and poise of DAC202 as "unexciting" or pedestrian. There are DAC's out there that will spew out laser-like sparkle and spotlight in the treble that can deceive the ears into thinking sound is spectacular in a short-term audition. Problems arise when living with such DAC's over a long period through many recordings of varying quality, as average recordings will become unbearable and great recordings will tend to have a sameness imparted from the DAC's inherent colorations. Similar things will happen with other colorations, such as gut-busting, wall-crushing bass or midrange way too round and dripping with harmonics to be true. The Weiss does not impart any impression of such sonic anomalies and walks the fine line expertly, presenting the music in its best light while not sugar-coating recording's deficiencies to music's detriment. It is in fact as neutral and transparent as audio equipment gets, but as we all know, one man's neutrality can be another man's frustration. So why Weiss? So far the review discussed mostly what the Weiss does not do wrong, but what does it do so right that it demands to be heard? First of all, It resolves musical information to the Nth degree and does it without shoving it in your face. All the information is right there in front of you, and one needs to just slightly shift his attention to various instruments in the soundstage to hear each in its unerring clarity and nuance. It is akin to looking at a high-resolution photo that has enough resolution that it actually looks natural and not glistening, yet if one zooms in to a particular area in the photo, all the detail is plainly available. There are other DAC technologies that are loved for other reasons but cannot come close to this kind of resolution. For example, I have auditioned and owned some NOS (non-oversampling) DAC's that render the central vocal or main instrument with lovely color, contrast, and texture, but as soon as one tries to zoom in to areas way off to the side or back, the resolution is not nearly as high. Some of the classic multi-bit, non-upsampling, but oversampling DAC's often excel in dynamics and detailing but often suffer from "digititis" and grain structure that is too coarse. Many of the recent DAC's using high-tech chips like Sabre and extreme upsampling, e.g. Sabre ES9018 at 1.536MHz, tends to have much finer grain structure and soundstaging excellence in specificity and 3D panorama. Of course, personal preference plays a big part, and some listeners will actually prefer the presentation of NOS or straight-oversampling DAC's for a more forward and dominant center fill, but it is difficult to deny that the Weiss presents very high resolution in the entire soundstage in a most natural manner while presenting a gorgeous yet neutral midrange center devoid of extra fat. Secondly, the Weiss can really rock in the nether region and soar in the highs. It has an amazingly solid, extended, non-bloated bass line that will provide excellent foundation for music. Solid-state DAC's tend to excel in bass when compared to most tube DAC's, but the Weiss takes it to another level and just hands you the rhythmic goods. We are not talking about cyber- robotic, one-note hammer bass but elastic bass that can boogie with electronica as well as cello or acoustic bass. PRAT and bass nuance is close to ideal, and while some may prefer a more heavy-handed presentation, that would not serve all music genre equally. As far as treble extension, often a less-extended treble tends to emphasize the mid-to-low treble and upper-midrange, tending to give the impression of more spot lit and obvious highs, which some people may actually mistake for more and "better" treble. However, when the very top end is truly extended, like the Weiss, the spot lit, edgy presentation disappears and a velvety, creamy air permeates the soundstage, which is similar to what happens when one adds a good supertweeter to a loudspeaker, i.e. highs become airier and creamier. Thirdly, DAC202 has excellent instrumental and midrange timbres. Due to DAC202's neutrality, there is no extra or undue richness or roundness in the midrange. Therefore, one does need to pay attention to setting up the Weiss with well-judged peripherals and cabling, but once properly set up, Weiss presents vocals and instruments with authenticity of timbre and emotional impact. Texture is extremely fine, consistent with what one often hears with ultra-high sampling rate of 1.536MHz and state-of-the-art digital technology combined with well-judged analogue stages. Center image is not the forward, grainier, dominant type that seems chiseled out separated from the rest of the sonic background that some other DAC topologies can present, but it presents a natural presence harmoniously interweaved into the rest of the soundstage tapestry, which happens to be huge and room-filling. Lastly, the Weiss can be the foundation of your computer audio system with minimal fuss and hassle while allowing astounding 24-bit/96kHz to 192kHz high resolution audio. There are all kinds of complicated, multi-box solutions to the music server, but going by personal experience, computer audio should be kept as simple as humanly possible. Unless one is an IT professional, involving a bunch of proprietary NAS boxes with RAID, networking, multi-room access, proprietary server and playback software and hardware, etc can quickly lead to extreme frustration when something goes wrong. The beauty of Weiss is that one can simply connect the DAC to your computer with a FireWire and be done with it. No network or internet is needed, and one can use the remote control to change volume, phase, and upsampling filter from the listening seat. Simple and effective, and there is very little that can go wrong. The FireWire also allows playback of music files up to 192kHz from the computer, and when the recording quality is up to the task, the resulting sound quality can be downright astounding. While it is true the availability of 24-bit/96kHz or 24-bit/192kHz music has quite a bit to be desired, they are being offered by more and more websites, and it is certainly where the future is headed. Listening to a well-recorded 24bit/192kHz music file on the Weiss via FireWire can easily be the pinnacle of an audiophile's journey and may even convince a hardened vinyl lover. The fact even 44.1kHz music sounds so great on the Weiss does take some pain away from the relative lack of high resolution music at this time. Many Weiss users likely do not use the headphone jack regularly, if ever, which would be a shame because the headphone output on the Weiss DAC202 is actually quite good considering it is really just a bonus feature. One great little feature is the fact the headphone output voltage can be adjusted in the analogue domain, just like the line-level output signal on the Weiss, which allows one to optimize the output depending on headphones' sensitivity. The venerable Sennheiser HD600 headphones fitted with aftermarket ALOSXC headphone cable was used mostly to evaluate the headphone output. The HD600 is somewhat of a benchmark and standard in the headphone circles for its unbelievable performance-to-price to ratio as well as how well it "scales" with better cables and headphone amplifiers, with many headphone aficionados preferring it to the newer HD650, and some even to the ultra-high-end HD800. The Weiss drove the HD600 surprisingly well, especially given how demanding HD600 is on the amplifier. The sonic goodness heard through the DAC's line-out translated pretty well to the headphone output, no doubt owing to the excellent digital-to-analogue conversion. No nasty surprises or frequency anomalies were present, and an overall balanced presentation with nice speed was heard. Detail retrieval was excellent, which is always a strong point of headphone listening. If you are a headphone guru who powers HD600 "balanced" with multiple-chassis dedicated headphone amplifiers with a dozen tubes glowing, then you already know the little headphone jack on the Weiss is not going to satisfy. The rest should have no qualms about enjoying the DAC's headphone output for most uses. Now we enter an area of mystery, maybe even mysticism. How often have you read a manufacturers claim their DAC XYZ's digital input is "totally asynchronous" from the transport; therefore, different transports and digital cables should not make any difference. Unfortunately, many audiophiles still report hearing significant differences among digital cables, USB cables, and even FireWire cables no matter how asynchronous and jitter-free a DAC's design claims to be. The Weiss should have presented very little difference among different digital and FireWire cables given its asynchronous operation with the master clock right next to the DAC chip. Well, Sterevox XV2, XV Ultra, custom single crystal silver, and custom single crystal copper S/PDIF cables all sounded different feeding the S/PDIF input on the Weiss, and what was even more puzzling was they sounded different even when the computer transport was slaved to the DAC using the sync cable. FireWire cable was no exception, either, with a generic LaCie FireWire cable sounding very different from Revelation Audio Labs Prophecy Cryo-Silver FireWire Cable. 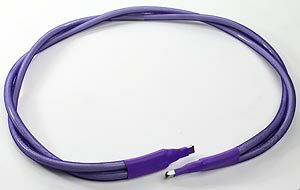 Exotic and expensive FireWire cable is not necessarily required to get the full benefit of the Weiss, however, and the generic cable was used often with no regrets. The silver FireWire cable did have better extension on top and bottom with overall smoother sound, but the Weiss still sounded great with the cheap cable, with certain music benefiting more from the more midrange-centric and grainier/contrastier detailing of the cheap cable, which may be partly due to shielding differences. 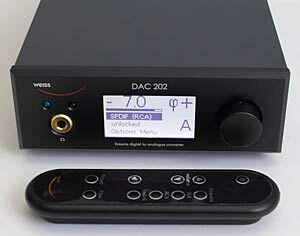 Weiss DAC202 currently represents the latest thinking and implementation of state-of-the-art in digital technology. As with all things audio, not everyone will agree, and certainly personal preference and system synergy represent the big elephant in the room. If I had pick some nicks, I would have preferred the FireWire connectors to be located further away from the power connector. When using a thick audiophile power cord and thick audiophile FireWire cable at the same time, the space was very tight resulting in the two cables coming in tight contact. Another huge nit involves the price, which is going to be the sore point for most music lovers. Some of those few-hundred-dollar DAC's from overseas actually sound quite decent maybe even great these days, especially when used in moderately-budgeted systems where resolution is not high. The Weiss is for audiophiles with deep pockets who already own top-notch, high-resolution systems that can reap the true benefits of this DAC. If that individual is also into computer audio and wants asynchronous FireWire, then this DAC essentially is the only game in town. Still, I once had this DAC sitting right next to the legendary, tank-like Accuphase DP-75 CD player, which made the DAC look and feel almost like a toy. Considering the price, I wish the Weiss was built into heavier chassis with Accuphase-like build quality, but then again, who else does these days? Based on purely musical grounds and unbeatable computer-audio capability, Weiss DAC202 is very highly recommended for those who want and need this level of performance.